Han Jong-hee, the President of Visual Display Business at Samsung Electronics, revealed that the company has completed the technologies of Micro LED and is in a stage to raise production yields. The Wall display is scheduled in September with the target market of hotels, shops, stadiums, museums, convention centers and luxury mansions. 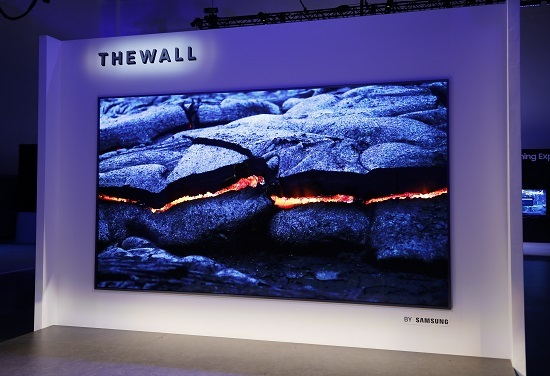 According to Samsung, The Wall is a display rather than TV as the company considered that consumers could do whatever they want with the display. Also, being bezel-free, the product will not be in fixed sizes like conventional TVs. The customers could select the display pieces according to their need and splice the pieces into the sizes they want to fit in any space. The household version of The Wall will be 30 millimeters thin or thinner. Samsung’s Micro LED displays use flip-chip bonding technology owned by the company which interconnects semiconductor devices like integrated circuit chips to external circuitry with solder bumps that have deposited onto chip pads. The company also disclosed that the display will adopt ultra-low reflection black technology, new color enhancing LED chip technology and advanced shock-resistance technology for performing excellent contrast. Furthermore, the lifespans of the Micro LED display will be around 100,000 hours.